Ann was raised at 62 Red Lion Street in the Clerkenwell neighborhood of London. Her father's watch-making business allowed them a very comfortable life there, and the children received an extensive and liberal education. It was passed down in one branch of the family that Ann was a fine pianist, was a pupil of Mendelssohn and was chosen to perform with him for Queen Victoria. She may very well have been a fine pianist, but what is known of Mendelssohn makes her being his pupil and performing before the Queen under his direction not plausible. His performances at Buckingham Palace post dated Ann's removal with her family to the United States. Like many oral histories, there may be an element of truth to this, maybe something much more simple that was elaborated over time and in the repeated telling if it. It would be interesting to know more specifically about her education, since she brought it to bear once they were in Ohio. Family tradition says that the house Horace had built on the outskirts of Cincinnati cost more than he could afford, one of Horace's various "follies," and that they had to sell it and move into the city. Nothing has been found that suggests Horace had an occupation once they settled in the United States. The Gooch's appear in the 1840 Cincinnati directory, and they were listed as running a boarding school for ladies. A vague reference is made to Horace being connected with it, but an advertisement shows it was Ann who ran it. Newspaper ads for the school have been found as early as November of 1837 when the family still lived at Beech Grove, their house outside the city. BOARDING SCHOOL FOR YOUNG LADIES, BEECH GROVE, CINCINNATI. MRS. GOOCH, having completed her arrangements, is now prepared to receive Young Ladies to Board and Educate. The Course of Instruction will comprise the English language in its various branches: Writing, Arithmetic, Geography with the use of Maps and Globes, French, Piano Forte, Harp, Dancing and Drawing with flower and velvet painting. The house is commodious, and beautifully situated on the Lebanon Turnpike road, two miles from the city. 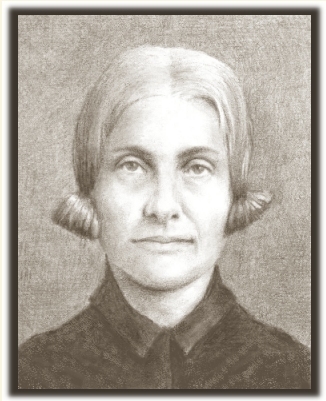 Mrs. Gooch, having been accustomed to tuition, for several years, feels the importance of her undertaking; but trusts, by unremittig assiduity, to advance the moral and intellectual improvements of her pupils, equal to the expectations of their parents. School will commence on MONDAY, the 28th of November. In the next year the advertisements were worded a little differently. They announced they had room for a few more students. The house was described as "large, airy and healthy." Of particular interest is the statement that "Mrs. Gooch, having been educated for her profession, and for several years joint principal in a similar establishment, feels sanguine in the expectation that her system will promote the moral and intellectual improvement of her pupils..." This may mean that she found a position in a school in Cincinnati before 1837, and is supported by her being "accustomed to tuition." This was surely the more archaic meaning of that word, which was the instruction of a small group in higher learning. She may even have been teaching in London before she was married. GOOCH - on Saturday Evening 28th inst. at the residence of Henry Gooch, 61st year of her age. The funeral will take place this afternoon July 30 at 3 o'clock from the St. John's Episcopal Church corner Seventh and Plum Streets. Friends of the family are invited to attend. This was St. John's Church, mentioned above, and was built in 1851. 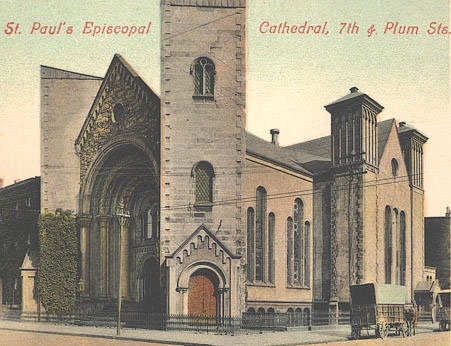 It later became St. Paul's Cathedral and was torn down in 1937.
vital records sources: Ann's birth date comes from a family Bible owned in 2010 by Patrick Verdier. Her baptism on 28 September 1799 us in the records of St. John the Baptist (also known as St. John of Jerusalem) Chapel, Clerkenwell. That record says she born on 20 September, but the Bible record is favored here. Her marriage is in the records of St. John's Chapel and is noted in The Times of London, 25 March 1831. Her death is noted in The Cincinnati Daily Gazette, 30 July 1860.